Kolding, as 7th largest Danish municipality, has been for centuries a very traditional business area with a lot of production (e.g. steel or plastic, logistics, etc.). The strategic location on the main highways in Denmark supports distribution of produced goods. In order to sustain the municipal attractiveness, in times of limited resources and public funding shortages on one hand and inhabitants expecting of continuous prosperity on the other hand, the city councilor looked for new methods. Kolding seemed to have a relentless demand of innovation; a desire for growth, welfare and efficiency. Watch a YouTube Video about it. Design has answers in terms of understanding customers, more suitable compared to traditional methods of market and business analysis. Design can be used as an intelligent method of customer insight for business development. Easy to grasp methods and practices are what small and medium sized companies need to provide better value to their customers. Kolding kommune has established its own design secretariat with more than 90 professional design consultants investigating future scenarios and future solutions for the region. Activities around Vision 2022 utilize practices of design and agility. That is e.g. stakeholder were involved from the establishing phase in 2012. Over time the campaign aimed to make results visible, that inhabitants can see and experience progress and get further involved. Informal involvement of all kind of stakeholders gave them ownership and pride. Kolding aims to be a full-scale design community by 2022 by setting design leadership as a main competence of the region. Strengthening business by offering a strong design environment with free service of support. Design driven innovation empowers and sustains businesses. A full-scale design community means to Kolding kommune that all partners have an informed voice. 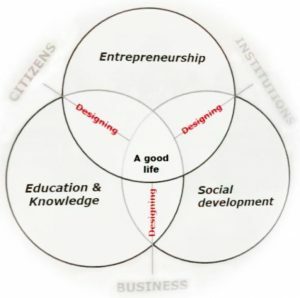 Everyone listens and collaborates to solve problems in the field of social development and business. It is great to see, how Kolding municipal provides a tool kit and platform for regional advancement; Inviting business and education to make their own interpretation and developing their own strategy, what design means to them; Engaging on multiple levels to solve welfare problems (physical design of the city and its roads, provisioning and development of offered welfare services) with innovation and design smoothly across various organizational borders and involving generations from kindergarten to retirement home. Malin Orebäck from Veryday highlights the importance of Service Design Thinking for Business Innovation by addressing Societal Challenges. Traditional business models aim to generate as much money as possible, without taking too much responsibility on what is happening in society or environment. Watch a Vimeo Video about it. Service Design Thinking explores alternative business models, where value creation is distributed across involved players. Putting the societal challenge at the center and creating new opportunity of shared value among stakeholders. Traditional business needs to look at this challenges with a different lens. Revisiting the value chain and identifying gaps on it have been neglected till today. Engaging people on grass root level for collaboration and sustainability in new ways. This is a relevant topic in the design research community. Designers have to take a closer look at their role and how to increase societal impact by finding and facilitating new ways to set up Service Design business models. One great quote Malin Orebäck presented is “It is a question of search strategy: If you are not taught to look systematically for win-win opportunities, you will only see trade-offs. Trade-offs seem to be “out there’, whereas win-win opportunities must be discovered – and created.” by Christoph Luetge and Benedikt von Liel, Financial Times. I truly believe that traditional businesses have to anticipate dynamic markets of the 21st century. These markets are very much different from markets of the industrial revolution and mass production era. Companies have to reinvent their business model to survive; collaborating with their customers to discover, deliver and harvest sustainable societal shared value.